A loosely tied sequel to Studio Ghibli's 1995 romance Whisper of the Heart, The Cat Returns takes an odd choice of side character – the dashing Baron Humbert von Gikkingen, a cat statue come to life – and plants him in a whimsical adventure of his own. With scatty, tomboyish girl protagonist Haru in a quandary over being forced into marriage with the prince of a hidden feline kingdom after saving his life, a chance encounter leads her to cross paths with the Baron and his eccentric assistants, who charitably agree to help her out. 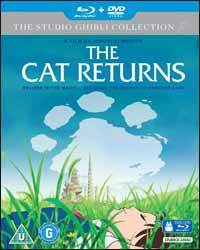 The Cat Returns partakes of Ghibli's best-known strengths – heartfelt romantic drama and otherworldly fantasy – yet doesn't quite succeed in marrying the two, with Haru's home life and personality established in only skimpy detail before the fantastic journey into the Kingdom of Cats takes over. At a mere 75 minutes, the film betrays its roots as a storyboard treatment whipped up into a feature-length animation; if only more time could have been spent developing Haru and strengthening her relationships with the other characters, a really satisfying movie could have been the result. As it is, The Cat Returns feels rather slight in the company of its peers. Fortunately, the imagination and technical accomplishment familiar from past Ghibli features is present and carries the film breezily through – with the eerie sequence in which Haru discovers the Baron's office, a breakneck pursuit through city streets punctuated by magical portals, and the arrival in the Cat Kingdom itself all standing out as highlights. The King and his court provide excellent comedy, and the music score and voice acting, while not dazzling, are admirable. It feels unfair on The Cat Returns to praise it halfheartedly, but in the Ghibli pantheon it's a rather underwhelming representative. For anyone who might be looking to introduce a young viewer to the joys of Ghibli movies, though, it's a perfectly adequate entry point that doesn't overstay its welcome.